Culture Smart! Zambia offers the reader a glimpse behind the tourist panorama of unspoilt nature and the busy urban life, luxury hotels, shopping malls, and rush-hour bottlenecks of Zambia’s big cities. It paints a vivid picture of the psyche of a people who have been shaped by their geography and history. Zambia is a scenic utopia with a stunning landscape of forest, woodland, and grassland traversed by mighty rivers whose journeys are marked by floodplains, swamps, waterfalls, lakes, and long, languid loops to the sea. In Zambia the “real Africa” of old mixes comfortably with the new. This large, landlocked country in central southern Africa is named after the mighty Zambezi River, which rises in the remote Kalene Hills in its northwest. Mineral-rich, with vast untapped agricultural, water, energy, and human potential, Zambia sits on the investor’s leader board for Africa. The Zambian people reflect the blend of traditional and modern Africa. A nation made up of more than seventy ethnic groups, it has moved through diverse tribal histories, European colonization, socialist philosophy and rhetoric, and, finally, a gung-ho charge into multiparty capitalism in the early 1990s. 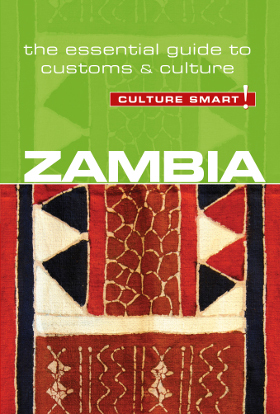 This pocket guide provides a rare insight into the feelings, behavior, and ideas that permeate Zambian society, which will enable visitors to understand their hosts more fully and make the most of their stay. Men and women may shake hands upon meeting, but it is also common to see each make a greeting by standing at a distance, clasping their own hands in front of their chests, and bowing their heads with a smile. Alternatively, the two parties may bow and gently pat their chests with the right hand in recognition of the other person.